The Snowflake lift begins a few steps up from a small pedestrian plaza with a few parking spots nearby for skier drop off, in a residential neighborhood of condos, townhomes and a few small lodges. 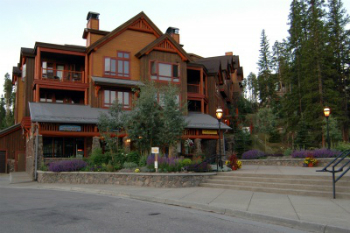 Bluesky Breckenridge condos for sale are lodge-style condominiums that are located right on that plaza at the base of the lift. The Snowflake Lift conveniently transports skiers high on Peak 8 of the Breckenridge Ski Resort – high enough to make it easy to ski to Peak 7, or 9, as well. Snowflake and Four O’clock runs return to this lift, and inside the door of the lodge are ski and boot storage lockers. The free town shuttle stops here, too, but a walk to downtown Breckenridge is only about 4 blocks downhill. Read more about Bluesky, or start your search with the Bluesky Breckenridge condominium listings below. Bluesky Breckenridge real estate was built in 2005, and a relatively new addition to the Snowflake area. Most of the units are 2-bedroom and 2-bath and are actively rented by the current management team, the Resort Company, a Wyndham vacation rental company. The Spa at Breckenridge is on site and open daily, and so is an outdoor, heated pool and hot tub. The building has elevators, heated underground parking, a fitness center and a game room. Bluesky condos for sale will usually have rental records and these revenues are likely to be very high compared to other properties in the area. They’re newer than most, and are more actively marketing for short-term vacations. Bluesky is perfect for a condo buyer looking for no maintenance, better than average income, plus true ski-in/ski-out. Size: from 1022 to 2390 sq. ft. 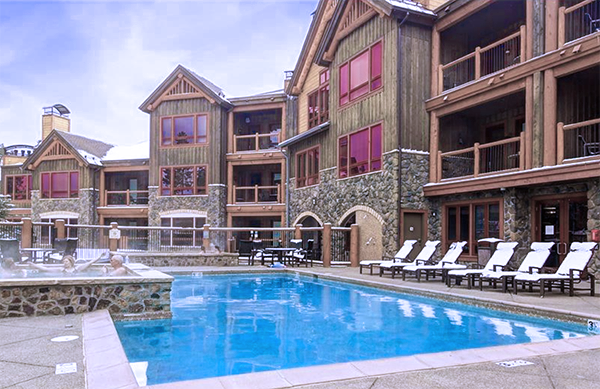 Amenities: at the Snowflake Lift, on bus route, 24-hour front desk, weekend tavern open, spa, fitness room, pool, hot tubs. Head west on Four O’clock Road and turn into the parking area for Bluesky just past the intersection with Snowflake Dr.
Don't hesitate to contact us if you have any questions about Summit County real estate. You can send us a message online, now!